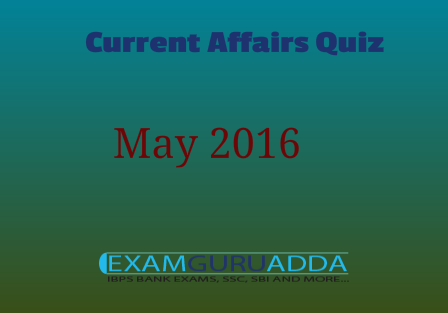 Dear Readers Examguruadda.in presents Current Affairs quiz of 11th May and 12th May 2016 that cover important current affair events. Current Affairs quiz prepared according to the latest Bank, SSC and other competitive exams. 1. Who was elected as the Chairman of the International Cricket Council (ICC)? 2. Who was named as the NBA’s Most Valuable Player? 3. Uttar Pradesh Cabinet has given its approval to develop over 197 km long ‘bicycle highway’ between which cities? 4. National Technology Day is being observed across India on...? 5. What was the theme of National Technology Day that was observed across the nation on 11 May 2016? 6. Which State has received the Best Indian Destination for Wildlife Award? 7. Indian Navy launches underwater Harbour Defence Systems at which place ? 8. Who won 2016 Philippines Presidential Election? 9. Who has been recommended by the Hockey India for the 2016 Arjun Award? 10. Ranganathittu Bird sanctuary is loacted in which state of India?